oftwominds-Charles Hugh Smith: Is the U.S. Dollar Set to Soar? Which blocs/nations are most likely to face banking/liquidity crises in the next year? Hating the U.S. dollar offers the same rewards as hating a dominant sports team: it feels righteous to root for the underdogs, but it's generally unwise to let that enthusiasm become the basis of one's bets. Personally, I favor the emergence of non-state reserve currencies, for example, blockchain crypto-currencies or precious-metal-backed private currencies--currencies which can't be devalued by self-serving central banks or the private elites that control them. The key take-away is the preponderance of the U.S. and the Anglo-American alliance, a.k.a. the special relationship of Great Britain and the U.S. 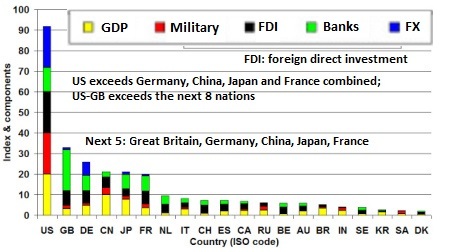 The U.S. exceeds Germany, China, Japan and France combined, and the U.S.-Great Britain alliance is roughly equal to the next 10 nations: the four listed above plus The Netherlands, Switzerland, Italy, Spain, Canada and the Russian Federation. We don't have to like it, but as investors it's highly risky to act like it isn't reality. There are other fundamentals at work as well. A. It must allow the currency to float freely on the global foreign exchange (FX) market; it cannot maintain a peg to another currency, for example the U.S. dollar.Any currency pegged to the U.S. dollar is simply a proxy for the USD, further confirming its exorbitant privilege as the dominant reserve currency. B. It must run a large permanent trade deficit with the rest of the world as a means of exporting sufficient currency for others to use as reserves. How do you export trillions of RMB, dollars, quatloos, etc. into the global economy if you're running trade surpluses? Short answer: you can't. You're sucking in other nations' currencies, not distributing your own in size. Recall that global GDP is north of $100 trillion and there are about $300 trillion in financial assets floating around the world. A reserve currency must be issued in size, meaning in the tens of trillions, to be useful to nations other than the issuing nation. C. Chinese authorities face a quandary. If they let the RMB float (i.e. end the peg to the USD), they risk a devaluation that sets off an extremely problematic capital flight. If they let the RMB float and the RMB soars higher, other exporter nations will be happy to exploit the higher RMB by siphoning off China's export industries. 2. Which blocs/nations are most likely to face banking/liquidity crises in the next year? Hmm; the E.U., China and Japan come to mind. The U.S.--not so much. Leverage is lower, collateral is higher, and capital flows favor the U.S.
3. Which would you rather receive on $1 billion: -.05% interest or +.25% interest? Even if the Federal Reserve doesn't raise rates in December, U.S. Treasury rates offer much higher yields and much lower risks of currency devaluations than competing sovereign bonds. If you want to "follow the money," follow capital flows. Capital is gushing out of China like flood waters through a broken dike into North America. (Canada and the U.S. also have a special relationship, as do Canada-U.S.-Mexico). Now let's look at a weekly and daily chart of the USD. After a couple years of consolidation/forming a base, the USD shot almost 20% higher in late 2014. 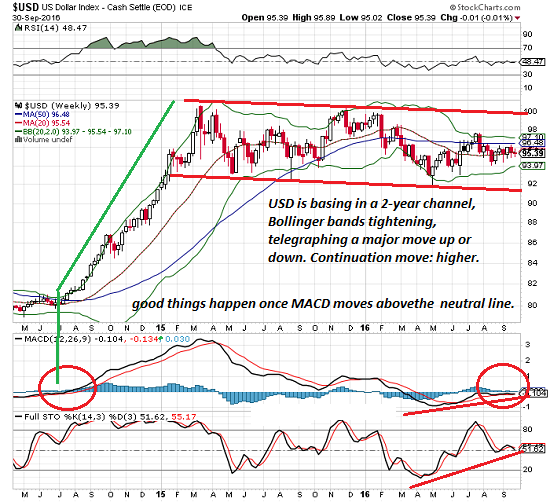 Now that the USD has spent almost 2 years in another period of consolidation, the Bollinger Bands are tightening and MACD has worked its way back to the neutral line. This looks a lot like the conditions that preceded the USD's previous 20% gain. 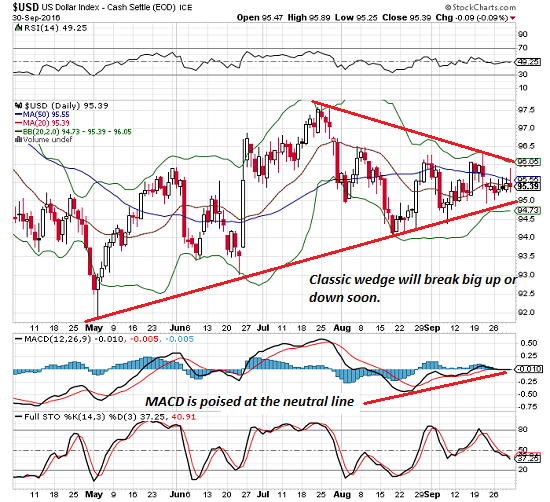 The daily chart is tracing out a classic wedge that typically breaks big up or down. The MACD is hovering near the neutral line; good things happen when MACD moves above the neutral line. Wedges tend to break in continuation moves: if the trend is higher, they break higher. If the trend is lower, they break lower. The USD has been trending higher since 2014, and there is little to suggest the long-term trend has reversed. The FX roulette wheel is still spinning, but the ball will drop fairly soon, if not in Q4 2016 then in Q1 2017. Thank you, Kristina B. ($10), for your splendidly generous contribution to this site-- I am greatly honored by your support and readership.